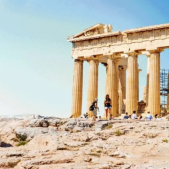 The Parthenon is one of seven ancient ruins that are featured in the project “7 ancient ruins around the world, reconstructed” by Expedia, demonstrating the glory of ancient ruins around the world. As Expedia mentions ancient ruins give us a fascinating window into the past: how people lived, the spaces they inhabited and their daily lives. Historians, architects and travellers alike marvel at these remnants of time past, but it’s often hard to get a sense of what these spectacular buildings would have looked like at their peak. The Expedia team decided to step back in time and recreate some of our favorite ancient ruins in their original locations. Back in ancient times, this temple sheltered a monumental golden statue of Athena, the Greek goddess of wisdom, craft and war. Sitting atop the hill at the Acropolis, an ancient citadel in Athens, the Parthenon cuts an imposing shape. Cobá is a Mayan ruin in the Mexican state of Quintana Roo. The site is thought to have been first settled between 100 BC and 100 AD and abandoned around 1550, upon the arrival of the Spanish conquistadors. At 137 feet tall, Nohoch Mul is the tallest Mayan pyramid on the Yucatan Peninsula and the second tallest Mayan pyramid in the world. It was discovered in the 1800s, but the archaeological site wasn’t opened to the public until 1973, as the thick jungle which surrounded it made it difficult to find. It’s off the beaten path, but nowadays you can get there by public transport or car. Built in dedication to Jupiter, the god of the sky and thunder, this temple was the main center of religious life in the ancient city of Pompeii, a small Roman town on the Bay of Naples. It stood dominant in the Forum, with Mount Vesuvius looming ominously behind it. The volcano erupted in August of 79 AD, tragically destroying Pompeii. The site was rediscovered in the 16th century, and many years of excavation have given the millions of yearly visitors a fascinating insight into the daily life of this 1st century Roman city. Stretching 73 miles across some of the most dramatic countryside in England, Hadrian’s Wall dates back to the 1st century AD. Historians still debate the reasons for the construction of the wall. The most popular theory is that on becoming Roman Emperor in 117 AD, Hadrian had the wall built to make his empire more secure. To increase security, forts known as milcastles were placed along the wall at intervals of approximately one Roman mile. Here we’ve recreated one the milecastles, so if you’re planning a visit to the wall, why not try and locate it? Since its inception, Luxor Temple, which takes its name from the Arabic term, al-Uksur (“fortification”), has been a sacred site. Commissioned by Amenhotep III in 1380 BC, the temple was renovated by Rameses II about a hundred years later to incorporate a great pylon gateway and an open courtyard. It was once joined to the neighbouring Karnak Temple by an avenue of sphinxes, who guarded the temple gates. With epic obelisks and architraves, Luxor Temple represents some of ancient Egypt’s most monumental stone architecture. It’s a testimony to the country’s long history and a must-see on any Egyptian holiday. Teotihuacán was one of the first urban centers in central Mexico and is now one of the most important archeology sites in Mexico. It was constructed between the 1st and 7th centuries CE, but we know very little about the people who built it and lived here. They built the first complex cities in the region and then mysteriously disappeared. The Pyramid of the Sun is the largest building in Teotihuacan and one of the oldest pyramids in central Mexico. It is also one of the largest, and as you can see from this reconstruction, it was a spectacular mountain of a structure. This square in Rome houses not one, but four Roman temple ruins. It was discovered during construction work in the 1920s. Temple B is the most recent of the four temples, and six of its columns, the original flight of steps and the altar are all still intact. Visitors to the area will not only find a fascinating archaeological site, but also hundreds of cats living among the ruins. Volunteers feed, clean and look after the cats and visitors are encouraged to say hello or even adopt one of them. Here is what the temple would have looked like, minus the cats. Whether you’re a history buff, architecture enthusiast, or planning your next getaway, a trip to one of these incredible sites won’t leave you disappointed. Whichever ruin you choose to visit, make sure you have these reconstructions handy so you can see what they looked like in their prime.